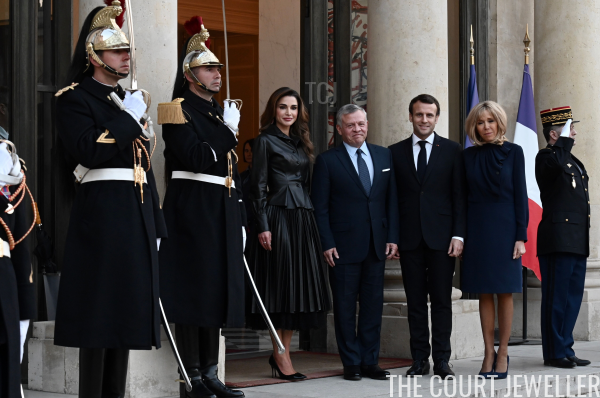 King Abdullah II and Queen Rania of Jordan made a whirlwind tour of Europe on Friday, and today, I've got a glimpse of both jewelry looks from the visit. After a stop in Morocco, the Jordanian royal couple headed to Assisi, where King Abdullah received the Lamp of the Peace of St. Francis. The Hashemite court noted that the king received the award "in recognition of his efforts to promote human rights, harmony, interfaith dialogue, and peace in the Middle East and the world." 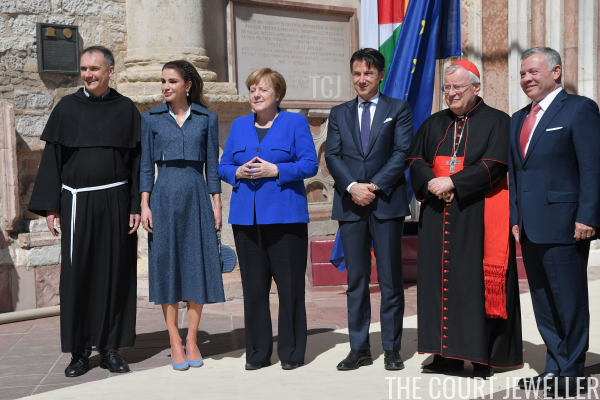 While in Assisi, Abdullah also held meetings with German Chancellor Angela Merkel and Italian Prime Minister Giuseppe Conte, as well as Antonio Tajani, President of the European Parliament. In Italy, Queen Rania wore a hairstyle that showed off various pairs of modern earrings, including a silver-toned pair with a blue center stone. Next, the couple headed to Paris for talks with President Emmanuel Macron. The court noted that the discussion centered on "the Palestinian cause and Jerusalem, as well as regional developments." Macron and his wife, Birgitte, greeted the couple at the Elysee Palace. Rania's earrings were a little harder to glimpse during the French visit, but here you can see that she wore a rather elaborate pair of dangles. 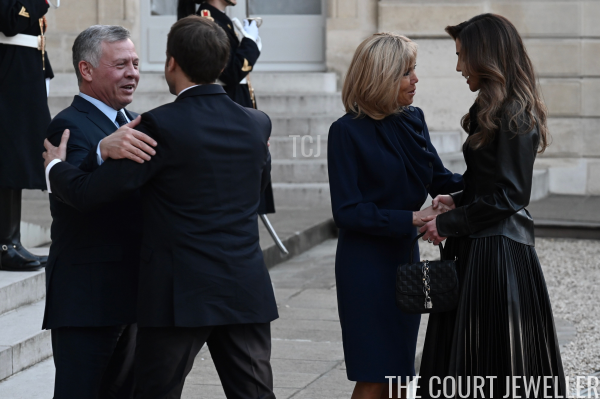 After wrapping up their trip to Paris, the couple headed to Tunisia before returning to Jordan.